First of all, players must reach level 30 in order to create a guild. More importantly, creating a guild costs 5 Gold. 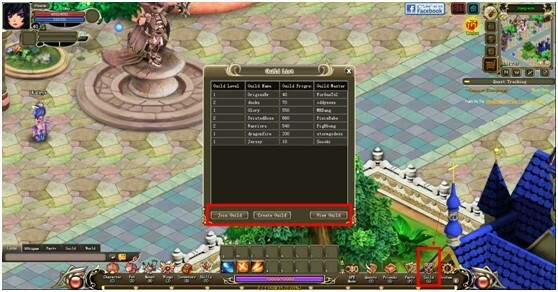 If you have met both criteria, simply open the Guild Interface, click Create Guild and input a guild name. First, open up the Guild interface (Shortcut – G). Select a guild you are interested in, and then click Join Guild. Next, input a self-introduction as to why you would like to join their guild. You will then need to wait for the guild master to accept or reject your guild application. Guild masters may only accept applications from players who are currently online. Hi, I want to create a guild but I don’t know how to make those cool symbols the other guild have. How do I insert them? hi how i get the 5 gold to create the guild? only buying with real money? hey, I was confused I saw a lvl 12 leader of the guild. So, is there also a "pass leadership"? Umm…If i create a guild in guild interface instead of creating to guild npc. Does it cost 5 gold? I Play this game how do u get Guild Stone? ?